Freedom of choice, self-determination and self-responsibility in life and at at life’s end: This is what DIGNITAS – To live with dignity – To die with dignity continues to work for internationally – in its political and legal work, in its daily advising of individuals seeking help and in preparing and providing assisted suicide for suffering individuals who have made a clear and well-considered choice and who are still denied this right in their home country. Feel free to share our newsletter with other interested parties. You are also welcome to show support for our goals and international activities by joining as a member or by making a donation. Much is being written about DIGNITAS – To live with dignity – To die with dignity. However, few people know that the association’s activities go far beyond assisted suicide and that it advises people from all over the world on questions of quality of life, prevention of suicide attempts, patients’ rights and access to palliative care in their home country, and that it is committed to promoting human rights politically and legally both in Switzerland and abroad. 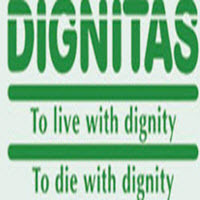 DIGNITAS has decided to increasingly share and make available to the general public its experience and knowledge gained from 20 years of international commitment to self-determination, freedom of choice, self-responsibility and dignity in life until life’s end. To this purpose, DIGNITAS has set up DIGNITAS Academy, which aims to promote research, education, training and knowledge transfer on topics such as the preservation of quality of life in connection with old age or illness, the prevention of suicide attempts, self-determination and freedom of choice in life and at life’s end. DIGNITAS Academy started with two events in Zurich in autumn. On 3 October 2018, a public panel discussion explored the question of whether and to what extent it makes a difference for relatives whether they see the death of a loved one coming or they are taken by surprise. On 8 November 2018, experts from law and medicine shared their knowledge on the topic of “Legal certainty and advisory competence in dealing with assisted suicide” with doctors and other medical specialists at a half-day event. More information on DIGNITAS Academy can be found at www.dignitas-academy.ch (in German). ….70 years ago, on 10 December 1948, the United Nations General Assembly in Paris adopted the Universal Declaration of Human Rights? The Declaration significantly influenced the European Convention on Human Rights, which was adopted by the Council of Europe in Rome only two years later and entered into force in 1953. The European Court of Human Rights (ECHR) in Strasbourg deals with and decides on cases in which the highest court of a country has handed down a judgment which, in the plaintiff’s view, violates the European Convention on Human Rights. With regard to self-determination at the end of life, the ECHR has proven to be quite progressive so far. In the 2011 judgment of the HAAS vs. Switzerland case, the ECHR expressly affirmed the right / freedom of choice and self-determination in “last matters”, with reference to Article 8 of the Convention*. Therefore, every human being – if he or she is able to judge – is free to decide about the end of his or her life, regardless of whether or not he or she is considered ill from a medical point of view. Nevertheless, it should be noted that numerous countries which have signed the ECHR have laws that to date restrict or even completely disregard this right. Presentation (video) and handout by Silvan Luley, Board Member of DIGNITAS – To live with dignity – To die with dignity.